It's been another busy week with crop sessions, baking, planning Miss C's birthday party, running around like crazy for the party, and of course, a layout. Miss C turned seven on Thursday this week. She's usually a bus goer, so was very excited to be a "walker". 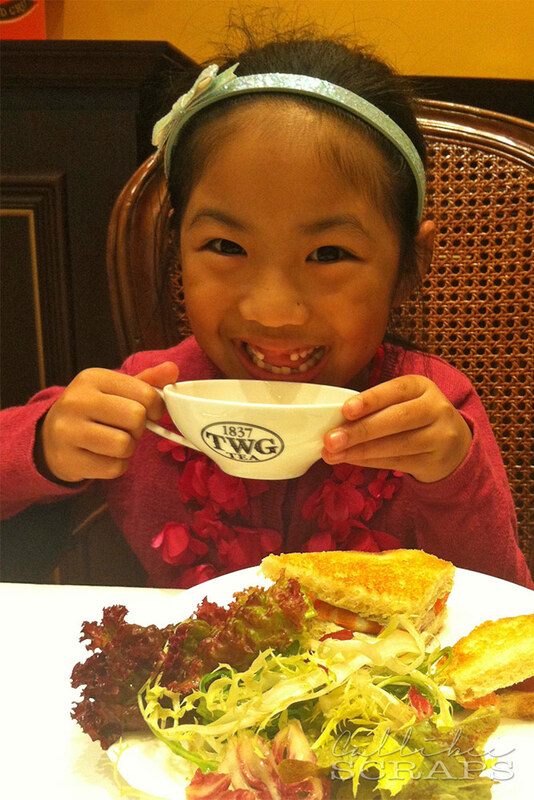 I picked her up from school and she was treated to a proper afternoon tea at TWG, before putting on some 3D glasses to watch Oz the Great and Powerful. I did have my reservations about bringing her to watch this film, as I had heard it was pretty scary - and there were some scenes where she hid under my arm, but she enjoyed it nonetheless. After that, we queued an hour for her favourite sushi. By this time, it was already eight o'clock, so we quickly gobbled down our salmon and tuna, before heading home. Puffle cupcakes that Miss C took to school. Proper afternoon tea with sandwiches, cake and scones. 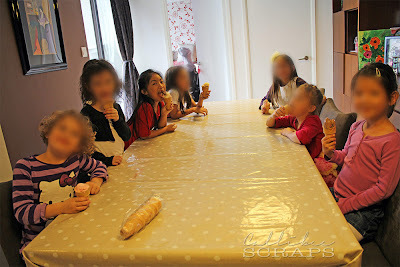 Since Miss C's actual birthday fell on a weekday, we held her party today. 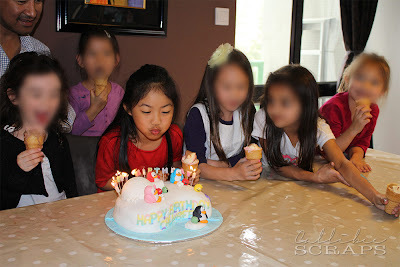 This year, she wanted Club Penguin as her party theme. It's a kid's online game, with penguins and their puffle pets, so of course I had to come up with all sorts of things penguin and puffles. Luckily, there is one toy shop that does a few items and lots of online references for me to draw from. 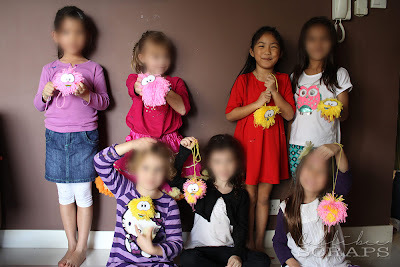 I allowed her to invite six friends, and they had a blast making pom pom puffles, very messy slime, enjoyed some games, ice cream and cake. It's nice to have a smaller number of kids. Much more manageable than previous years. I think next year, I'm going to take the numbers down even more and have an outing instead. Showing off their pom pom puffles. Enjoying an icecream before the cake. Blowing out her many candles. 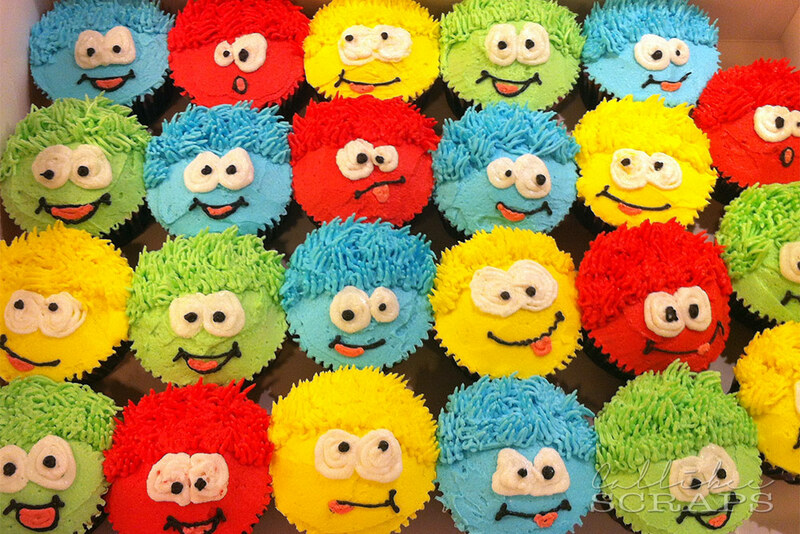 It really is quite stressful, planning and executing a birthday party, so I'm pretty glad that it's over for another year. Next thing to do though, is to scrapbook the events. Check back for those, as I'll be using some new papers that are coming into the HKMC shop very, very soon.